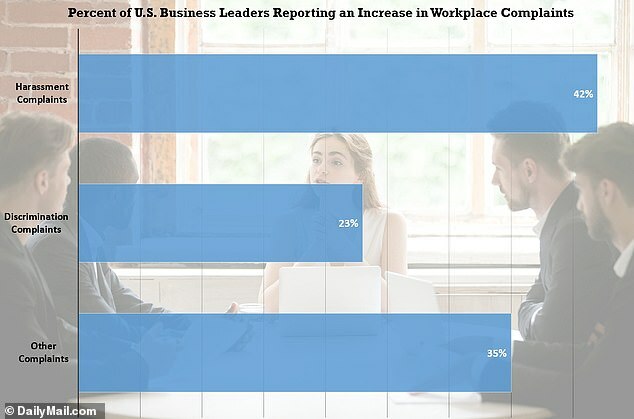 Reports of sexual harassment in the workplace have been on the rise, with 42 percent of business leaders saying they've seen an uptick in complaints within their own companies in the 18 months since the #metoo movement launched on Twitter, according to a new survey. The poll, conducted by Proskauer Rose law firm, interviewed people across the U.S. who make 'high-level decisions regarding employment issues,' according to their report. Their findings are consistent with government data: The number of sexual harassment lawsuits filed by the federal government against U.S. employers increased by more than 50 percent, year-on-year in 2018. During the same period, the Equal Employment Opportunity Commission saw a 50 percent increase in the amount of money recovered for victims, which totaled nearly $70 million in fiscal year 2018.